IA Design were tasked to deliver an intelligent design that captured a sense of community and pride. The design was to be comfortable and inspiring for staff, with a strong focus on a collaborative and flexible environment. The design featured a large collaboration zone, which included a dynamic breakout, multiple collaboration spaces and the flexibility of an open plan space to host events for all staff occupying the 1,000m2 tenancy. The front of house inspired a sophisticated, flexible and welcoming design; supporting a series of meeting rooms, alongside a 30-person boardroom. A variety of workstations allow staff to take advantage of sit-to-stand health benefits and variability. 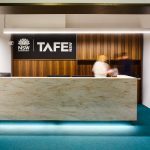 The fit-out exceeded expectations and provided the Department of Employment with a contemporary and inspirational environment.